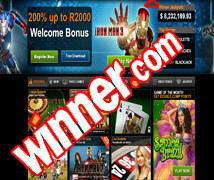 Winner casino was launched in 2009 and has grown to become a very popular online casino today, and South African players are welcome! Winner offers over 300 games including Baccarat, Blackjack, Poker, Roulette and Slots. They also provide outlets for classic Bingo, Social gaming, Scratch Cards, Live and Mobile casinos. Also featuring a variety of exciting tournaments, promotions, and loyalty incentives. Winner is operated by Zirconium Gaming Limited which is registered in Antigua & Barbuda.